Millennials already make up more than a third of the work force. By 2020, they will make up half. The sheer size of this cohort makes them a focus point for all employers. A survey from the National Society of High School Scholars offers a glimpse into the ambitions of the generation and provides insights that employers should heed. The survey asked 18,000 Americans, ages 15 to 29, to rank their ideal future employers, the results were curious. To nobody’s surprise, Google, Apple and Facebook appeared high on the list but so did the Central Intelligence Agency, the Federal Bureau of Investigation, and the National Security Agency. 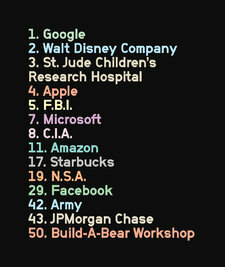 The Build-A-Bear Workshop was 50, just a few spots behind Lockheed Martin and JPMorgan Chase. The New York Times came in at 16. The diversity in the type of employers millennials want to work for emphasizes what matters most to them. For this generation, income, security, prestige, and other characteristics that used to make employers attractive no longer have priority. Survey after survey shows that millennials want to work for companies that place a premium on employee welfare, offer flexible scheduling, and bestow a sense of purpose. The companies on this list are diverse in many ways but are similar in one very important way – they care for their employees. It is also important to remember that millennials have been shaped by a recession, unprecedented student debt, and a broad decline in the credibility of all kinds of institutions. Stability is an abstract concept to these young workers, and as a result, they tend to focus on living in the present rather than planning for an uncertain future. How these desires map onto companies like Google and Facebook is clear, given their strong roots in philanthropy and innovation. But the high ranking of national-security employers also speaks, just as clearly, to millennials’ hope to make a difference in the world. One thing is clear. Companies that want to attract the best young workers are already finding that they need to accommodate these wishes. The ones that do the best jobs accommodating these wishes do so through a multi-faceted strategy that starts with culture.